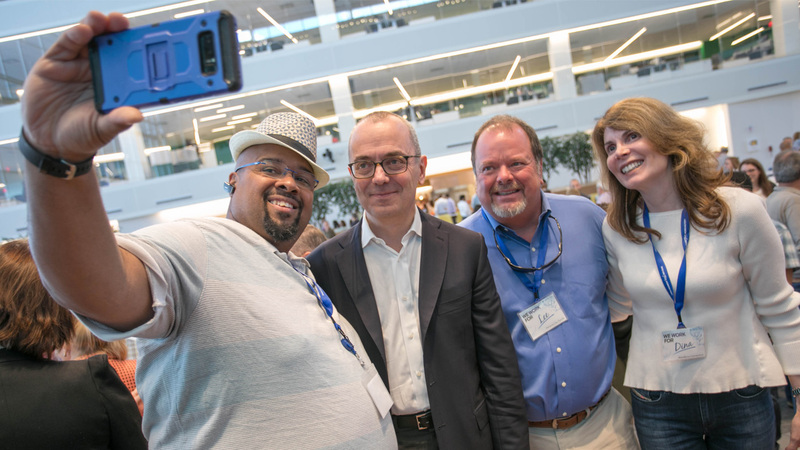 Chairman and CEO Giovanni Caforio, second from left, pictured with Bristol-Myers Squibb patients K.T., Lee and Dina. Who are you working for? That’s a question we at Bristol-Myers Squibb began asking ourselves five years ago to make sure we were keeping patients at the center of all we do. The answer — be it a close family member or treasured friend — is always deeply personal and reminds us that we can make a profound difference in the lives of others. Caforio, center, with patient Jessica at Global Patient Week 2017. Since our founding in the 1800s, patients have always been our guide star at Bristol-Myers Squibb. Those needing new therapies and their caregivers have long inspired us to push ahead on the frontiers of medical science, and to work with both speed and passion to bring forward life-changing therapies. I am very proud of how today’s generation of employees has embraced our commitment to patients. Caforio taking a selfie with Mitra, a patient whose mom is a scientist at Bristol-Myers Squibb. That commitment is reaffirmed each September through our Global Patient Week, which serves to galvanize our dedication to patients and remind us of our duty to them. Global Patient Week, now in its fourth year, is a highlight of our company’s calendar, as well as one of the most meaningful initiatives I’ve experienced in my 18 years with Bristol-Myers Squibb. Patients, of course, make Global Patient Week special. So do our employees, who routinely go “beyond the call” to help those who are seriously sick. One story, symbolic of hundreds, concerns a young girl going through cancer treatment in France. She was hospitalized and under anti-infection protocols. Several of our colleagues arrived at her family’s home on Christmas Eve, bearing an unexpected gift: a telepresence robot about her size that she could control, allowing her to participate in the rituals of the holiday and even “sit” at the family table. When our French employees discovered that the family home wasn’t internet-enabled, they rushed out to secure service, buying a router just minutes before the local store closed. Not all the stories are this dramatic, but all warm the heart, and all make it clear: while each of our 24,000 employees worldwide has a different role, we are united in a common mission: helping patients prevail over serious diseases. It's why we do what we do. During Global Patient Week, I am often asked, “Who are you working for?” I think of my family, my friends, and so many patients I’ve been privileged to meet during my career. Names like K.T., Dina, Anli, Letterio, Martin, Alicia and Mitra come to mind. It is humbling to hear their stories of courage and resilience. They always remind me why our work is both important — and never finished. Who are you working for? It’s not just a question. For all of us at Bristol-Myers Squibb, it’s our call to action — because when it comes to the needs of patients, now and in the future, there is always more to do.